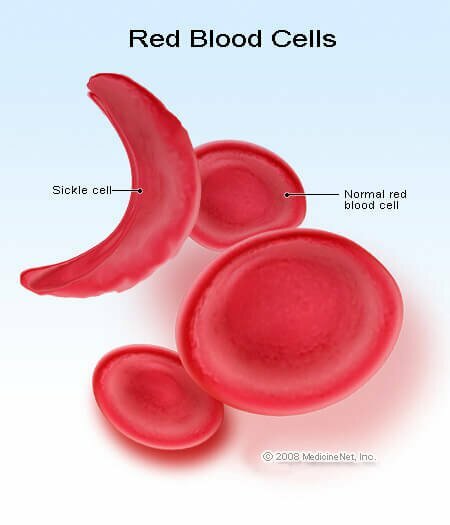 Sickle cell anemia: A genetic blood disease due to the presence of an abnormal form of hemoglobin, namely hemoglobin S. Hemoglobin is the molecule in red blood cells that transports oxygen from the lungs to the farthest areas of the body. Sickle cell anemia affects millions of people throughout the world. It is particularly common among people whose ancestors came from sub-Saharan Africa; Spanish-speaking regions (South America, Cuba, Central America); Saudi Arabia; India; and Mediterranean countries, such as Turkey, Greece, and Italy. In the USA, sickle cell disease occurs in about 1 in every 500 African-American births and 1 in every 1,000-1,400 Hispanic-American births. Sickle cell anemia is caused by an error in a gene that makes the beta globin chain of hemoglobin. The resultant abnormal hemoglobin (sickle hemoglobin) deforms the red blood cells when they are under low oxygen conditions. Children who inherit 2 copies of the sickle gene, one from each parent, have sickle cell anemia. Children who inherit the sickle gene from only one parent do not have the disease, but will carry the sickle cell trait. Individuals with sickle cell trait generally have no symptoms. About 2 million Americans (or 1 in 12 African-Americans) carry the sickle gene. The sickle mutation occurred thousands of years ago. The sickle gene became common in malarious areas because it affords a selective advantage against malaria. In the U.S., Canada, and many other countries where malaria is rare today, the sickle gene can no longer use its anti-malarial advantage. Instead, the sickle gene may be a serious threat to the carrier's children, who may inherit two abnormal sickle hemoglobin genes and have sickle cell anemia. In sickle cell anemia, the hemoglobin molecules tend to aggregate after unloading oxygen. They form long, rod-like structures that force the red cells to assume a sickle shape. Unlike normal red cells, which are usually smooth and deformable, the sickle red cells cannot squeeze through small blood vessels. The sickle cells block little vessels depriving the organs of blood and oxygen. This leads to the periodic episodes of pain and damages the vital organs. Whereas normal red blood cells last about 120 days in the bloodstream, sickle red cells die after only about 10 to 20 days. Because they cannot be replaced fast enough, the blood is chronically short of red blood cells causing anemia -- sickle cell anemia.